After more than one month of planning, I will finally have my well-deserved vacation on the last week of April. 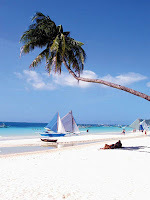 My folks and I are going to Kalibo, Aklan to celebrate a certain fiesta there then will make a one day stop at Boracay. Isn’t that nice? We will leave Manila on April 28 after lunch and will sadly return on May 2 morning, almost one straight week of rest and relaxation. To make sure I won’t be disturbed, I would turn my cellphone off. Hopefully, I won’t be bugged with work during my vacation. I am still thinking if I would bring my laptop with me so I could easily blog about my vacation. What’s so exciting with this trip is that it would be my first time to ride an airplane. Think about the first time. Aside from my first airplane trip, it would be my first time to visit Boracay. My two first! I just hope I won’t be silly inside the airport and the airplane. What goodies can I take home from the plane? Hehe…typical pinoy. I suggest you don't bring you laptop in your vacation. Feel some freedom from those gadgets you have and just enjoy Bora (especially since you'll just have a day there - make the most out of it). That's the same anticipation I had last year when I went to Bora. Apparently, it was also my first time to board an airplane and my first time to be in Bora then. So, I could vicariously feel your excitement. You want some goodies from the airplane? Hmmm... As I can remember, I took a barf bag as souvenir. Haha. But pictures would be the best souvenirs for me. Don't forget to use the toilet in the plane - for the sake of "maximizing" your first air flight experience. Hehe. Silly.